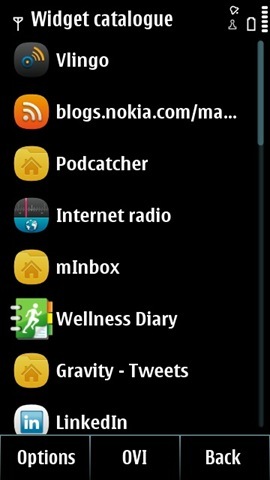 Once, the app is installed you are provided with a combined list view app and a homescreen widget. Setting up the homescreen widget just takes a long press on a homescreen and pressing one of the available widget locations or using the ‘Options’/ ‘Edit Home screen’ route and selecting. 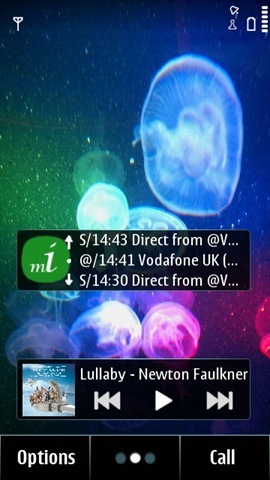 Once faced with the Widget catalogue screen you just need to select mInbox from the list. Press App logo: Opens the combined inbox app. Press upper/lower message: Scrolls up or down in the widget message list one message at a time. Press middle message: toggles between message heading and originator. In order to identify the types of messages received e-mails have a “@” symbol prefix with SMS and MMS prefixed with “S” and “M” respectively, followed by the date of receipt and the first 13-14 characters of the message/subject. The main negative on this interface is that the only way to read the complete message is to tap on the mInbox logo in the widget which opens the combined inbox at the top of the list and does not acknowledge the scrolled location in the homescreen widget. 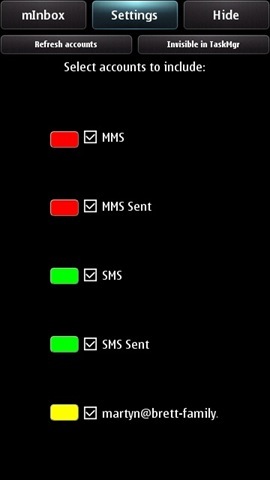 Once the main combined inbox app is opened each message account is assigned a colour via the settings menu, with support for multiple e-mail accounts and the ability to choose which accounts will/won’t be displayed. Although this screen displays substantially more message content than the Home screen widget the OS default Messaging and Mail apps are used to view the complete messages by tapping on the messages in the list. The screen layout clear, although it feels a little clunky with its 2-dimensional colour scheme and the right hand account identifier column seems to waste screen real estate. The question for those after this sort of app and Home screen widget combo is how interested are you in a polished, eye pleasing, user interface as mInbox has a way to go to achieve this. If you are after the combined inbox functionality provide by mInbox and are not put off by a less picturesque GUI then give it a try. With a price tag of £1 it certainly won’t break the bank and it is the only Symbian combined inbox app on the market. 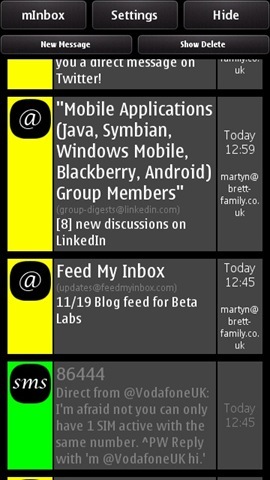 Although, in its current state, mInbox is not the app for me I will be keeping an eye on its development as with a little polish I think it could be a must have install, replacing the standard Mail widget on all Symbian Home screens..